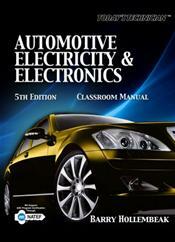 Unsurpassed in coverage of the theory and procedures for automotive electricity and electronics, the newest edition of this highly successful classroom and shop manual is guaranteed to instill both the knowledge and skills critical to success in the industry. TODAY'S TECHNICIAN: AUTOMOTIVE ELECTRICITY & ELECTRONICS, 5TH EDITION has been updated to offer a more streamlined presentation of diagnostic and service procedures, as well as additional attention to data bus networks, including the CAN, LIN, ISO, and other common systems. The book also features expanded coverage of vehicle accessory systems, including the new multi-stage air bag systems, weight classification systems, side air bag systems, and laser-guided cruise control systems. An all-new chapter on hybrid and high voltage systems rounds out the up-to-date content, ensuring readers gain a strong working knowledge that of the latest industry trends and technologies.